To remove epoxy grout haze from natural stone, porcelain or ceramic tiles. 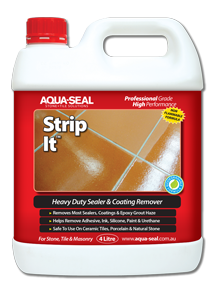 Strip-It is a safer, non-flammable, biodegradable, multi- purpose stripper formulated to stay wet for longer periods to give the product time to break down & help remove epoxy grout haze, remove sealers, coatings, urethane coatings, synthetic finishes, adhesives, silicone, paint, heavy wax, deep-set stains and heavy grease build up. USE: On all natural stone, ceramic tile, porcelain tile, terracotta and other surfaces. Removes heavy grease build up. Draws out & removes deep set stains. Carefully apply liberal amount of Strip-It to a small manageable area of up to 4m2. NOTE: Do NOT allow puddling in grout joints. NOTE: To help with residue removal, apply XtremeClean diluted 1 part with 5 parts water to the surface after Step 9. Allow dwell time of 5-10 minutes then scrub or agitate. Remove with wet vac then rinse thoroughly. Allow to fully dry. Note A: Epoxy Grout is formulated to be chemically resistant. The longer Epoxy Grout Haze is allowed to cure, the harder it will be to remove. Note B: For some applications, the use of a Steam Gun after the 30 minute dwell time of Strip-It and just before the scrubbing process, can help with removing the Epoxy Grout Haze. Note C: For cured or hard to remove Epoxy Grout Haze, contact Aqua-Seal STS Technical Services.